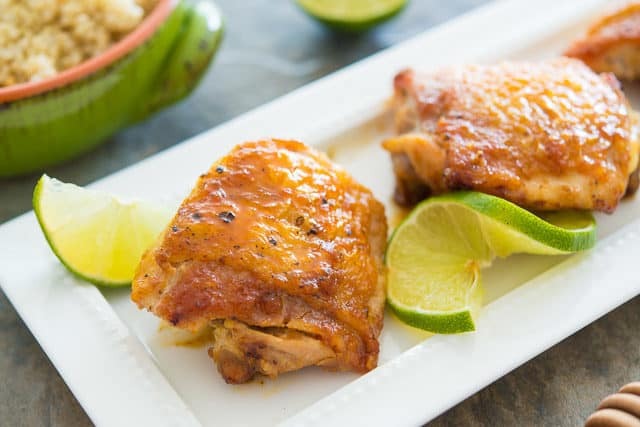 Honey Lime Chicken Thighs - Quick and Easy Recipe for Dinner! 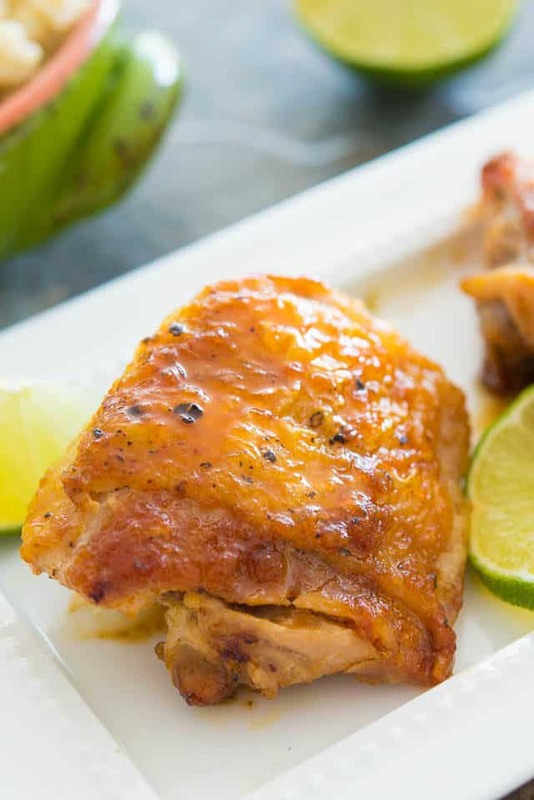 This simple Honey Lime Chicken Thighs recipe only calls for a few ingredients for a delicious sticky glaze: honey, zesty lime, and spicy sriracha! 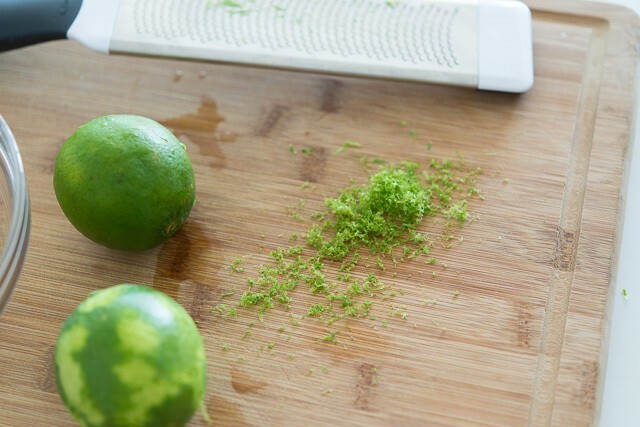 Are you ready for a super easy recipe that has a whole lot of flavor going on? 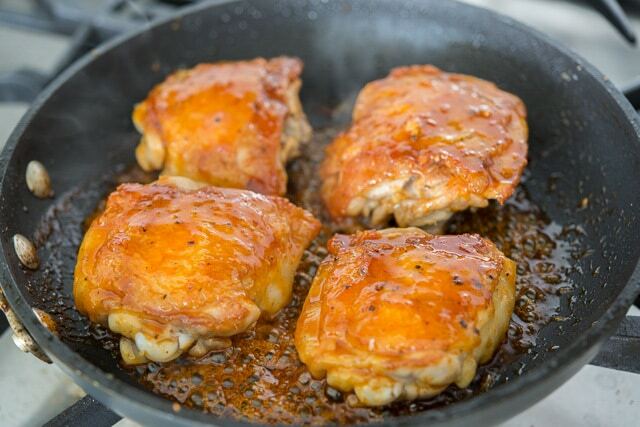 Pretty much all of the ingredients required for these Sticky Honey Lime Chicken Thighs are already in the title. The only thing that’s missing is a little bit of sriracha, which I add just to play off the sweetness of the honey. Sweet + spicy is one of the best flavor pairings of all! 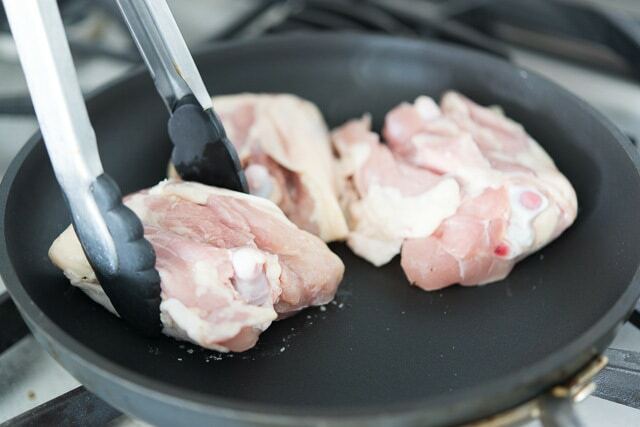 For this recipe, I like using bone-in, skin-on chicken thighs to maximize juiciness and flavor. While the chicken cooks, you’re going to make the glaze. But before we do that, let’s talk about honey for a second. Honey varies wildly in quality. 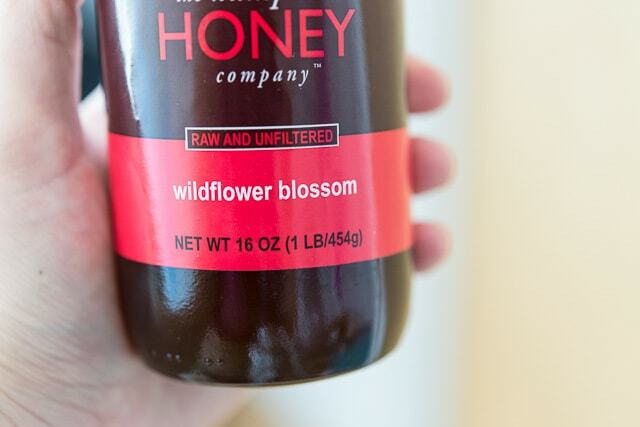 This article even talks about how most store honey isn’t really honey. I think this article skews pretty far on one side, but seriously, if you’ve ever tasted really cheap commercialized honey against an artisanal high-quality honey, it’s so easy to taste the difference. Small batch good quality honey is of course more expensive than the mass-produced stuff, but I think the latter isn’t even worth bothering with, making good honey worth the splurge. “Raw” and “unfiltered” are good words to look for, most of the time. Also, you’ll generally want to steer clear of the bear-shaped bottles. The reason we’re adding the glaze at the end is so the honey doesn’t burn. This dish is great with simple sides like Roasted Cauliflower and Crispy Smashed Potatoes. 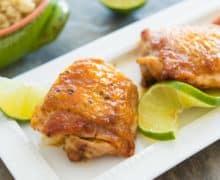 These simple chicken thighs only need a few ingredients for a delicious sticky glaze: honey, zesty lime, and spicy sriracha! Sprinkle the chicken all over with salt and pepper. 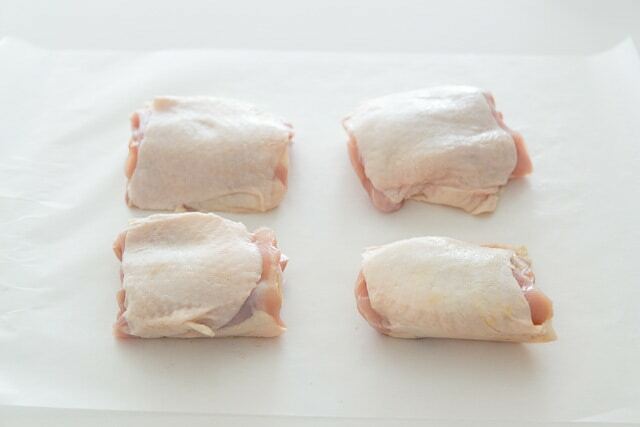 Place them in a nonstick pan skin side down over medium to medium high heat, and cook for 15 minutes. The idea here it to render the fat a little bit and crisp up the skin to a golden brown color. You don’t want the heat to be so high that the chicken skin burns, so keep an eye on it. 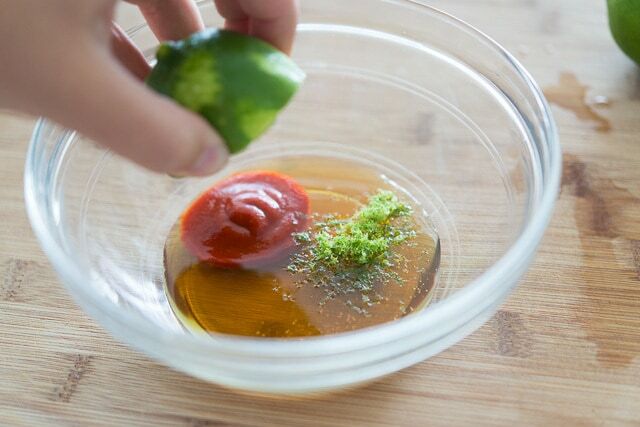 In the meantime, whisk together the sriracha, honey, lime zest, and lime juice. Set aside. 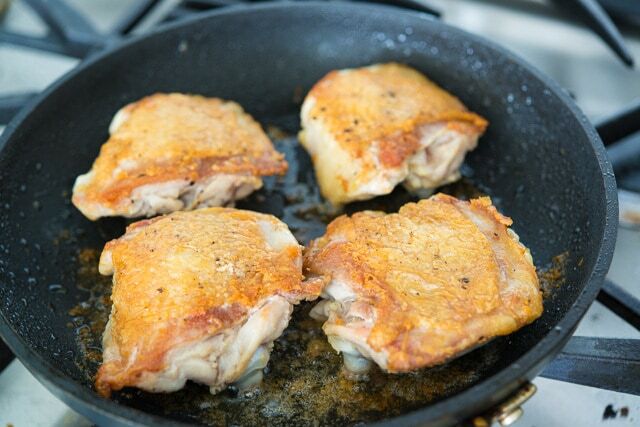 Once the chicken skin is golden brown, flip the chicken over and cook for another 10 minutes, until the chicken is almost cooked through (170 degrees F). 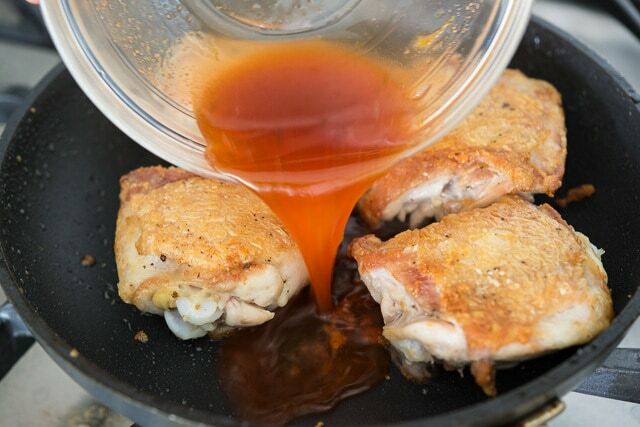 Pour the honey mixture into the pan and cook for another few minutes, basting the chicken until the liquid thickens into a glaze, until the chicken reaches 180 degrees F. Serve and enjoy! Post updated in November 2018. Originally published August 2015. I don’t know Vicki, but her comments were spot on. This recipe was freakin’ killer. And the best part was my wife asked if I could make this again tomorrow. And I will. Thank you so very much for making me look very good. Hi Michael, YAY!!!! That is so great. Glad that your wife loved it too! Yep, this was really good, hopefully leftovers will last for lunch tomorrow…. So glad you enjoyed the chicken, Carolyn! It’s actually a hot sauce! This is now a family favourite. so yummy. what do you think a good garnish would be. corianda, spring onion or parsley or something else. I made this for dinner tonight, and it was so freakin’ good! Husband and kids loved it too. I served sesame rice balls and green beans on the side.